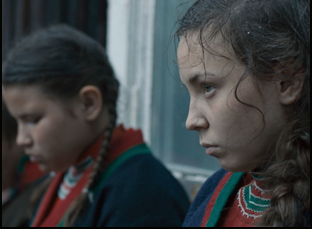 On growing up in Sweden as a descendant of the marginalized Sami community and using film to reconcile both sides of her family in this exhilarating coming-of-age story. 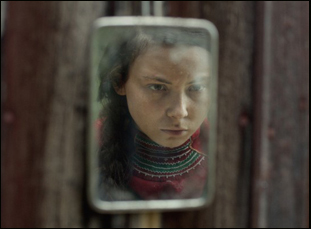 When Amanda Kernell was looking to cast the lead of her first feature “Sami Blood,” she had a nearly impossible list of demands for the young woman who would play Elle-Marja, a resilient 14-year-old growing up in the mountainous Lapland, at arm’s length both physically and socially from the rest of Sweden as part of the indigenous Sami people. To accurately depict the culture, this actress would need to be able to herd reindeer, know her way around a knife and sing in the traditional style of the Sami culture known as yoiking, as well as one of the 500 people on earth that are actually fluent in the South Sami dialect, preferably with a younger sister who could play that role in the film. Only when she discovered the Sparrok sisters did Kernell know she could make her movie. “They have a third sister [who was] also very good, so I had to choose between them,” Kernell said shortly before the film premiered earlier this year at Sundance, chuckling to herself about her unexpected surplus of potential leading ladies. Lene Cecilia Sparrok ultimately stepped into the role of Elle-Marja while her younger sis Mia Erika Sparrok assumes the same role as Njenna in “Sami Blood,” a stirring drama set in a world that Elle-Marja can’t run away from fast enough, but you will want to immerse yourself in since it’s never been captured onscreen before. While there are many breathtaking sights offered by the geography captured in the film, it is a suffocating environment for Elle-Marja, who is forced to attend a boarding school set up by the Swedish government to segregate and study the Sami people. Having to endure the indignity of literally being poked and prodded for supposedly scientific studies in front of her classmates, Elle-Marja imagines for herself a different persona as she starts to find ways to sneak out, yet bearing the responsibility of being the end of a bloodline whose continued viability depends on her, she grapples with the sacrifices she must make to assimilate. Kernell, herself a Sami descendant on her father’s side, sensitively tackles the touchy subject matter, but does so with the same confidence and gutsy resolve shown by her lead character, reflecting back on a time during the 1930s when racism was rearing its ugly head but suggesting with the film’s immediacy that we’re not as far removed from that era as we might like to think. In advance of the film’s American release this week, the writer/director spoke to us about how conscious she was of being the first to bring the story of Sami culture to the screen for mainstream audiences, as well as crafting a film that felt contemporary even if it took place in the past and the search for her lead actress. I’ve been making short films for 10 years, but nothing in this context, probably because it was harder and I had more pressure on me because I grew up with this story and it hasn’t been told before. I’m from a family where some of the elders want nothing to do with Sami people, but I’ve always known that they are Sami themselves and that they grew up with Sami as their first and only language as a child and now they’re someone else and have another name and we can’t talk about it. Then there’s this other side of my family that’s still in reindeer herding and [carrying on the] tradition and the language and the way of singing — yoiking — that is very important. So I always wondered how do you become someone else like that and what happened to this generation because it’s not just my family. A lot of people went to Sami boarding school and [were] put through these biology, phrenology exams and when they grew up, Samis were said to be the lower standing race, a lower stage of evolution, and couldn’t vote if you had reindeer, and I wanted to know what it does to you as a person to cut all ties with your background, your family and your culture. Because if we can’t talk about it, I had to investigate it. Were the seeds for the story of the film really there in your own family history or was there other research involved in creating this? I recorded interviews with elders in my family and also people who went to these Sami boarding schools while I was writing the script and then of course, it was very important to me to get the historical parts right and how these schools work and what they did and what they felt [like as students] going there, but the film’s also about growing up, so part of it is from my own life, being a teenage girl and wanting to be loved, trying to fit in, and not telling people everything about who you are because they might like you more if you lie a little bit. Many of the things in the film could’ve been from today. Given what’s going on in the world in terms of rising public displays of racism, that probably was more true than you knew at the time of putting it together. Did this feel more relevant as you were working on it? Yeah, but I’ve known for many years I wanted to do this film. I just wanted to be a good enough filmmaker first. [laughs] Because it’s writing history. There hasn’t been another film in the Sami language before – there are different Sami languages and there a couple of Sami feature films before in another language, but there has been nothing about this part of colonization and this shame and internalized racism, so I felt I had to be very good to make my family proud. But [while] making it, he world has turned more and more into the 1930s, in many ways. In Sweden, it was [just] discovered while I was writing that our state police [still kept] some ethnic record of Romanis — gypsies — and you’re not allowed to have that after the Second World War, but still they do, and when [“Sami Blood”] was premiering in Venice, they thought of it very much as a parallel story to what is going on in Europe today. It could’ve just as well could’ve taken place in a refugee camp today in Sweden in may ways, but I knew this world with reindeer herding where everyone has a knife and knows how to handle it and I wanted to take these pictures that I grew up hearing about or seeing, and put them into film to make people who never see themselves or someone like them on screen [in a way where] they could see themselves for the first time. In the film, the camera often stays quite close physically to Elle Marja, the lead character. How did that style of filming come about? That seems to extend to the idea you cast real sisters in the film. Yeah, they’re real sisters and they’re not just any teenagers. They’re special and they have this integrity and pride and strength. They also remind me of the women in my own family. My father always says, “They never break. They’re like the branches in the mountains. They never break, they just bend when it’s windy.” I wanted that kind of strength that you know [Elle Marja is] young, but she can survive anything. She knows who to handle a knife and she won’t give up and both of the sisters are like that in real life. They’ve been to Sami boarding school since they were six and when I asked them to be in the film, they said, “I can be in the film, but I can’t cry. So if you want someone who cries, you should look for someone else.” Very special for being 11 and 16 years old. I think everyone can cry — maybe you don’t do it normally — but you can put something in their eyes, and they were both like, “No, I don’t do fake. If it hurts, it should hurt.” So they only want like the real thing and everything is real in that sense in the film. It’s literally blood and sweat and tears. You’ve also said the singing – the yoiking – was so important to the film, you built the film around it. How so? I was so happy to be able to use it because I grew up with yoiking – it’s a heritage I carry myself, even though I don’t do it in public anymore – and I always thought it was probably great music for film. But it’s hard to make people yoik in front of a camera because yoiking was forbidden until the ‘70s, way back with death sentence and then just with fines, so it’s been really hidden. Even today, it was hard to make [the actors] yoik into the camera, even though they know how to do that. But I thought I should use it more as a score from the beginning, and then I decided that I should use it like the characters do it, but it’s not the [actual] score because if it’s the score, people think of it more as an indigenous story and I think the score should only convey her feelings and not make you think of a specific group of people. I wanted people to identify [with the story] and they seem to. A lot of people come up and say, “Oh this is really about me, my story…” and they’re from other background, not Sami background. In the end, the score is made by Kristian Eidnes Andersen, a great Swedish composer who also did the score for “Ida,” and makes a lot of music for Lars von Trier films. What has it been like to bring this out into the world? I look forward to showing it, but I’m also a bit worried what it does to people because this is still an open wound and hard to talk about for most people [in Sweden and the Sami community]. Once they made a theatrical play in Norway at a Sami theater about these boarding schools and they had to have therapists there for every show because people don’t talk about it. But to me, this [film is a] declaration of love to this older generation. I wanted to make an exciting film, a coming-of-age story with yoiking, and first kisses and [action], but making the film also had to do with me trying to repair something because as a child, I always wanted these sides of my family to reunite or that there should be some kind of atonement before [this generation] dies. I’m not sure it will happen in real life, so I had to create it somehow. But you don’t have to know anything about the Sami community to watch it. If it’s a world you don’t know, I think that’s exciting [because] I love watching movies about places I don’t know anything about. In a way, this is like making a sci-fi [film] because I can’t count on anyone knowing anything about this before, not even in Sweden. I’m so happy to screen it [in the U.S.] and it’s really kind of overwhelming with all these festivals. I had no idea making it. I feel like I’m picking all these wounds in my family and all of a sudden, people wanted to see that. It’s amazing. “Sami Blood” opens on June 2nd in New York at the Sunshine Cinema and open in Los Angeles on June 30th at the Laemmle Monica Film Center.